Each quarter we get a new snapshot of the camera market through the financial data released by the various camera companies. They tend to all report their data within the same week or two-week period, so it's a good time to take a look at the data and consider what it shows about the health of photography gear makers. This time of year is also the point where CIPA releases their final year-end statistics and future forecast. I've already dealt with the forecast, but I didn't present the breakout of the interchangeable lens camera market. If there were any other trends in the numbers, mirrorless showed growth quarter-by-quarter in 2013 while DSLRs were relatively flat from quarter-to-quarter in the last nine months of the year. I don't put a lot of weight into that, however, as CIPA shipment numbers are highly micromanaged by the camera companies, and we've had more new product introductions in mirrorless recently than we did in DSLRs. Shipments slightly outnumbered production for 2013 in both categories, which means that some of the shipments were coming from built-up inventory, too. Bottom line: if the CIPA forecasts are even close to right, to gain market share in 2014 any camera company must take it away from another camera company. There is no other choice. That's both good and bad news for photographers. The good news is that the likely way anyone tries to do that is with price. The bad news is that there will be losers in this battle, and either the strong (Canon/Nikon) will get weak or the weak (Fujifilm, Olympus, Panasonic, Ricoh, Sony) will get weaker. If any of the weak take market share from the weak, things will get particularly brutal. In essence, we're repeating the film camera wars towards the end of the SLR reign. Canon was the first to report their financials this quarter, and because they use the calendar year as their fiscal year, that also means that they reported yearly numbers as well as quarterly. The results in Canon's Imaging group were not good. The first year-to-year decline in interchangeable lens cameras, for instance (-7% in shipments, with a further -1% decline predicted for the coming year). These declines are attributed by Canon to drops in demand in Europe and China "due to the economic downturn." Compact cameras were down 28% in shipments for the year, with a further 20% decline predicted this year. Still, all those declines were under the overall decline in the market. Remember what I wrote above about strong versus weak players. Canon is a strong player. Operating profit for the group was down slightly year-to-year for the Canon Imaging Group, and they're definitely still under great stress and projected to drop again this year. Analysts who attended the financial results meeting in Tokyo and who cover Canon seem a bit non-plussed, with several remarking about how blasé Canon appears about the lack of unit volume growth in cameras. None of the countermeasures mentioned in their presentations really addresses the declining unit volumes in cameras. Instead Canon now is talking about more medical sales for imaging (last year it was more security camera sales as the growth prospect). Every indication is that Canon regards cameras as a fully mature market and is managing it as such. Fujifilm is a behemoth company with a small digital camera group. Even the Imaging Solutions division is big enough to make the digital camera part almost disappear within the financial reporting. Almost. To put that in perspective, overall sales at Fujifilm for the quarter were 1,774b yen, in Imaging only 101.7b yen, with digital cameras a fraction of that at 22.5b yen. Fujifilm did say that they expected the second half of the fiscal year (i.e. October 2013 through March 2014) to show a profit in digital cameras, but that profit would not be enough to offset losses in the first half of the year. Note that despite what must have been a dramatic decrease in compact camera sales, the overall revenue for digital cameras was down by only 3.7% year-to-year for the quarter. That's because Fujifilm is transitioning from high volume but low cost compact cameras to low volume but high cost X series models. Put the smallish nature of the Fujifilm camera sales together with the improving margins, and there's no real imperative for Fujifilm to do anything other than stay the course. Unlike some of the weaker camera companies that have a long string of losses that show no signs of letting up, Fujifilm seems to be stabilizing their camera situation. That plus the fact that it's less than 2% of the overall company means that they are unlikely to drop out of cameras in the foreseeable future. Expect more shift towards X cameras and more emphasis on low volume, high end product. Nikon is amongst the most transparent of the camera companies, offering fairly detailed looks into their still camera sales via breakouts of sales volume by type. Nikon's profit actually increased in the quarter, though I'm not sure that it was truly due to the reason Nikon stated ("better product mix of entry class D-SLR cameras and launching new middle/high class D-SLR cameras and others"). Certainly the declining yen had a great impact (for the quarter, 7.9b yen to the positive on profit of 39.3b yen). The problem for Nikon is that they're managing to profit on declining sales, in virtually all of their businesses. Even Precision showed a profit, with LCD steppers showing about the only unit growth in the company. Nikon, like Canon, blamed sales volume in China and Europe as being the primary culprits in lower-than-expected volume, and further lowered their unit volume forecast for the full year. Curiously, their net sales and operating income numbers overall are not unchanged: Nikon expects to increase sales and profit overall in the current year versus last year despite all these unit volume declines. As I've noted many times, Nikon is a very tightly managed company when it comes to dollars and cents. They are still in the midst of a large cost-cutting process, and they're both pushing more aggressively with the low-end DSLRs as well as higher end gear (pushing DX upgraders to FX, for instance). Still, the tough question for Nikon longer term is where does the growth come from? None of their businesses seem geared towards long-term growth, and we've all seen what the cost cutting has done to quality and service/support. The company is doing an incredible job of micromanaging the dollars and cents, but all of its business is in mature markets under stress. 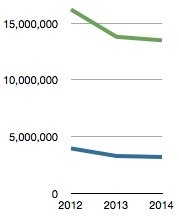 Note all those double-digit drops in unit volume in the camera business: that has to be corrected at some point. That said, Nikon is one of two strong players in the market. Indeed, Nikon is proving agile enough to keep market share (and even increase it in compacts) in a down market. That increases the pressure on the other players. Not only that, but everyone is trying to push the declining audience upscale. Olympus is still in a tough financial position, though improving. Their equity ratio, for example, about doubled year-to-year, plus their shareholder equity improved (though stock was diluted due to new issuance), both of which are signs that some of the underpinnings (assets, cash, liabilities, etc.) are coming back towards where they should be. That said, while sales and costs of sales both went down to improve the gross profit position, SG&A expenses continue to rise at Olympus (to 52.1% corporate wide), and they were already incredibly high. The camera business, however, continues to lose sales and profit. Overall sales declined 13.7%, mostly due to cutbacks in the compact camera lineup offset slightly by increased emphasis on top-end m4/3 cameras (e.g. E-M1). Losses were about halved year-to-year, but they're still huge compared to sales (for every dollar of sales, Olympus is losing about six cents in the Imaging group [and possibly more, read on]). 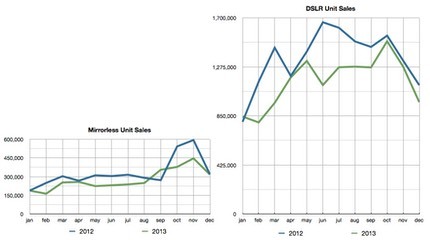 Olympus did break out data about mirrorless versus compact sales for a change. Compact sales still are higher than mirrorless camera sales in the first nine months of the year (33.3b yen versus 32.4b yen), though compacts are down 13.3% and mirrorless is up 1.7% year-over-year. I should point out that to meet their previous sales estimates for mirrorless for the full year (660K units), Olympus is going to have to a knock-it-out-of-the-park quarter. And those SG&A expenses are one of the things keeping them from making a profit in the business (50.6% SG&A in Imaging this year). It also appears that Olympus isn't stating their impairment loss from property and assets into the Imaging group's results, as that was 3.7b yen while the SG&A costs created a direct loss of 4.4b yen. In essence, it appears that they moved some of the loss from write downs out of the group's ledger and into the corporate ledger. Reading Olympus' reporting materials is a bit like trying to solve a puzzle. Little clues are scattered throughout, but the big charts/data presentations look decent. Note however the comment "Net sales target unmet because lower sales volumes of PEN series counteracted strong sales of OM-D series." When I write that I don't believe they'll meet their unit volume estimates made just three months ago, it is statements like this that are part of the clue (it also doesn't help that some executives are disclaiming the estimates on the side to analysts, but not publicly). The current number Olympus execs seem comfortable for the full year is an estimated 630k mirrorless units, which represents a 7% increase in unit volume from last year and a 4.5% decrease from their previous estimate. I should point out that Olympus rarely hits their estimates, even their private, adjusted ones. While Olympus indicated that they needed to "invigorate" the Pen cameras in the US and European markets, frankly their future seems much more predicated on the OM-D lineup, which is being reasonably well received worldwide. Even their presentation seems confused on this point: they present the Pen as "mid- and entry-level models," but then list the OM-D E-M10 as "entry-level model [for] users new to interchangeable lens cameras." You can't have it both ways, guys. Which one do you really want to sell to the entry user? Panasonic is another big company with a very small digital camera group (when measured as a percentage of overall sales). Unlike some of the other big conglomerates, Panasonic has a stated and practiced policy now of closing, revising, or selling unprofitable businesses. To some degree, cameras have gotten a bit of a reprieve in that Panasonic had bigger problems and had already addressed the contract business they acquired with the Sanyo purchase. Merging still cameras with the video ones also helped keep the still camera sales decline out of the limelight. So much so that cameras really weren't really mentioned in their financial results this quarter other than a brief value stated in the supplemental materials, as Panasonic had bigger fish to fry. The good news is that all that attention to rebuilding businesses to achieve a minimum of a 5% ROI is turning the overall ship around. While there are still some big question marks, all centered in the electronics segments, the overall company is now in a profit position with increasing revenue. That appears to be true of the camera operations, too, at least for the third quarter of their fiscal year. The bad news is that Panasonic is still making major moves to get their business in order. Along with their financial results, Panasonic announced that they were again moving the semiconductor group, which makes image sensors amongst other chips. This time it is being moved out of the Automotive and Industrial group and spun into a wholly owned, but separate, subsidiary. It's unclear exactly why the second shift is being made. That said, what's clear is that Panasonic is attempting to shift more from a consumer electronics company to a company that is as established in the automobile and housing markets. In their vision through 2018, Panasonic does not see the consumer electronics side growing in sales at all, while the auto and housing groups double in sales, and the business to business side also grows significantly. My sense is that if cameras continue to be troublesome for Panasonic, they're not wedded to the idea of continuing that effort like some of the other larger conglomerates seem to be. For the current quarter, note that Olympus is predicting a loss in the Imaging group still. True, a much smaller loss, but still another loss. Another company where cameras are an extremely small part of the overall business. So much so that cameras fall into "Other" in Ricoh's financial statements, and it shares that category with things like "lease financing." About the only statement regarding cameras was one that release of new cameras in the quarter contributed to the sales increase in "Other", though so did lease financing ;~). The "Other" category had a small operating loss (equivalent to less than .1% of the company's overall operating income), significantly down from the previous year. Bottom line for Ricoh: cameras are such a small part of their company that they generally don't even comment about how they're doing. As one analyst put it: cameras aren't even equivalent to a rounding error most of the time for Ricoh. Thus, the good news is that Ricoh can do pretty much whatever they like in cameras without having a real financial impact on the overall company at the moment. Unfortunately, I think that's the bad news, too. There's virtually no financial incentive to try to change the status quo. Ricoh could double their sales of cameras and it still wouldn't show up on the company's bottom line. In essence, cameras for Ricoh are absolutely what Steve Jobs used to refer to as "a hobby business," one that the company explores to keep its hand in the game looking for some significant upside, but one that isn't looked at for making any significant contribution to the corporate finances at the moment. Sony is a large company still trying to repair most of its consumer electronics offerings. Still cameras were previously folded into the video and professional imaging group, so it's a little less transparent what's happening with them these days. The good news is that the group, while showing lower sales numbers, is showing higher profitability. If you look at the "why" for that, a fair amount of the positive move is due to currency exchange (declining yen) and cost cutting. The forecast for the full year is that Sony expects flat sales numbers compared to last year and slightly better operating income numbers from what they've previously estimated. Before you get too excited about Sony's results, note that the drop off in volume in still cameras is about the same as the drop off in volume of personal computers, a division that Sony is now going to shed via sale to Japan Industrial Partners, a private company that has been picking up cast off divisions of Japanese companies for turnaround. The difference between the two divisions at the moment is that personal computers was bleeding substantive loss, while still cameras seem to have stabilized and may even be showing a slight profit at the moment. Sony's apparent goal in still cameras appears to be to go even further upscale, and to promote 4K video abilities, which they think will push their 4K TVs and other devices, plus give a new distribution outlet to their motion picture business.